The Cook's Tour: Food.Baking.Travel. : Portugal! 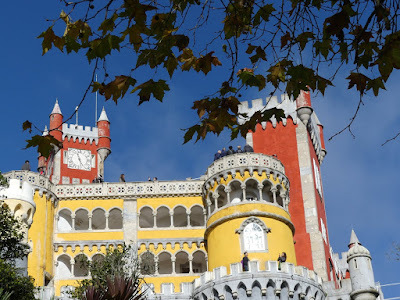 Well, this is a bit, er, very late, but I’m just now getting around to telling you about our Thanksgiving trip to Portugal. Portugal has been on my “must visit” list for quite some time. 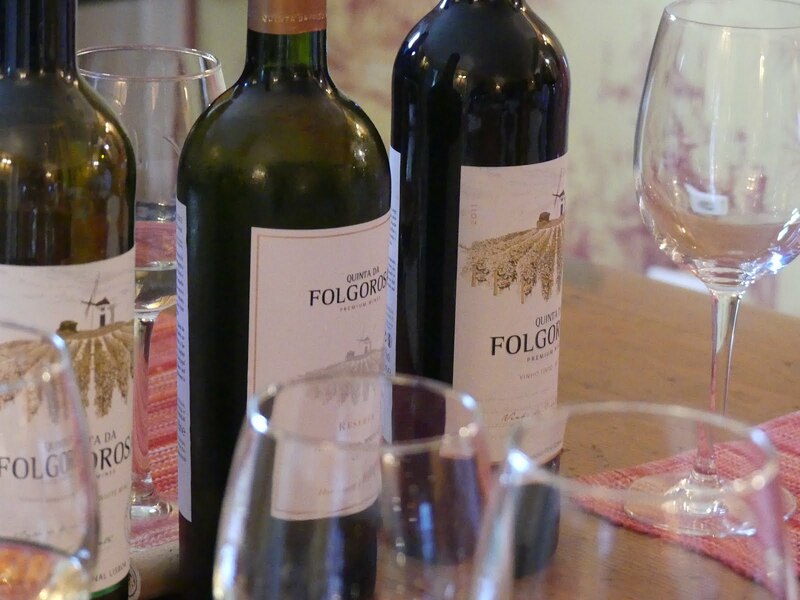 During the ten days we were there, we enjoyed a wide array of the many culinary delights Portugal has to offer. From "hole-in-the-wall" joints to Michelin starred venues. None of them disappointed. Somehow in all my pre-trip research I missed the fact that November is the start of Portugal's rainy season. I knew it wouldn't be beach weather, but I didn't expect almost every day to be gray, damp, and chilly. Not exactly the best sightseeing weather, but nevertheless, we did manage to get in our fair share of Portugal's beautiful castles, churches, museums, and coastline. One of our first stops was to the originator of the famous pastel de nata, otherwise known as a custard tart. 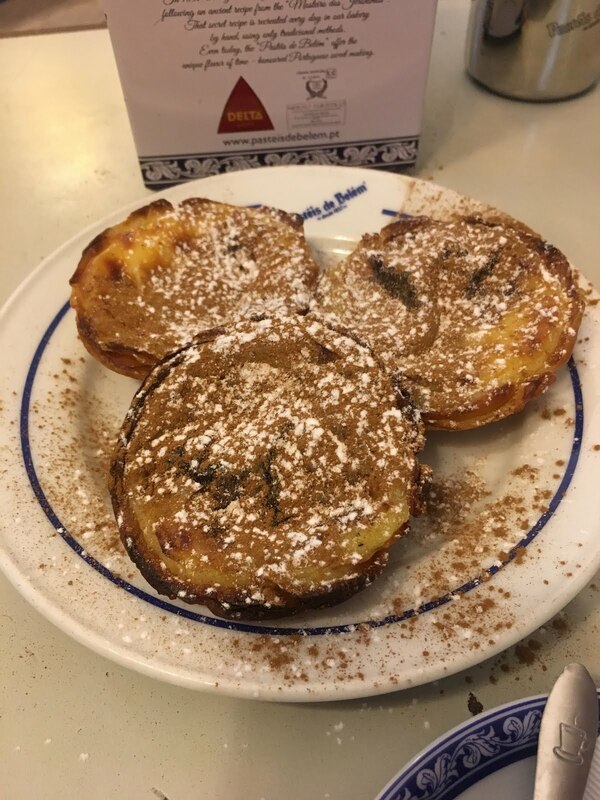 A big, bustling cafe, Pasteis de Belem has been in business since 1837. 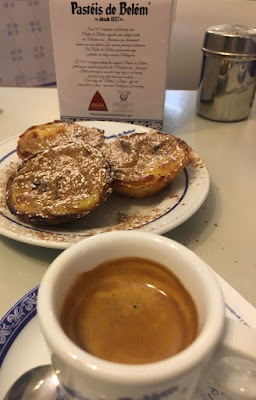 And while they produce all kinds of wonderful pastries, I was there for one thing and one thing only: the pastel de nata, or in my case, pasteis de nata (plural). Our guide lead us through the winding maze of rooms to a small table where we ordered espresso and pasteis. You can, of course, wait in line at the counter and get your goodies to go, but I wanted the full-on cafe experience. Minutes later, the waiter conferred to us the magnificent tarts. They come out slightly warm, and then you sprinkle a combination of powdered sugar and cinnamon over the top. The light, flaky pastry is like sugary air that just crumbles in your mouth. Right behind those flakes, comes the sweet custard, and in two bites the whole thing is gone! One is definitely not enough. They are exquisite. I have no idea how many pasteis are produced every day (all hand made) but when we visited there wasn't an empty table and the to-go line was out the door. You can find other bakeries throughout Lisbon making these famous tarts (and I tried many of them), but Pasteis de Belem is, hands down, the best. Early in the trip, our guide set up a visit to a small vintner in Torres Vedras, called Quinta da Folgorosa. 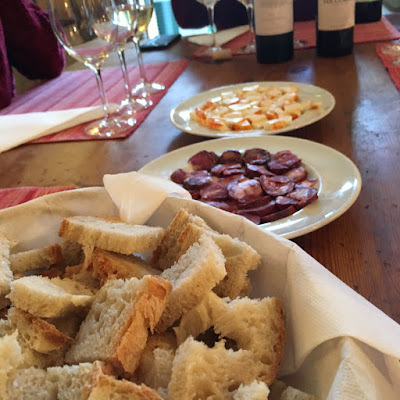 We spent a couple of very enjoyable hours with Jose Melicias, the managing director, as he took us through the lovely vinho bianco and rosso they produce. Making it even more enjoyable was the wonderful sheep’s milk cheese and Portuguese salami accompanying the tasting. We were so taken with the wines that we purchased a few bottles, not thinking about the logistics of getting them home. Luckily, our guide hooked us up with fabulous plastic sleeves made especially for air transport. 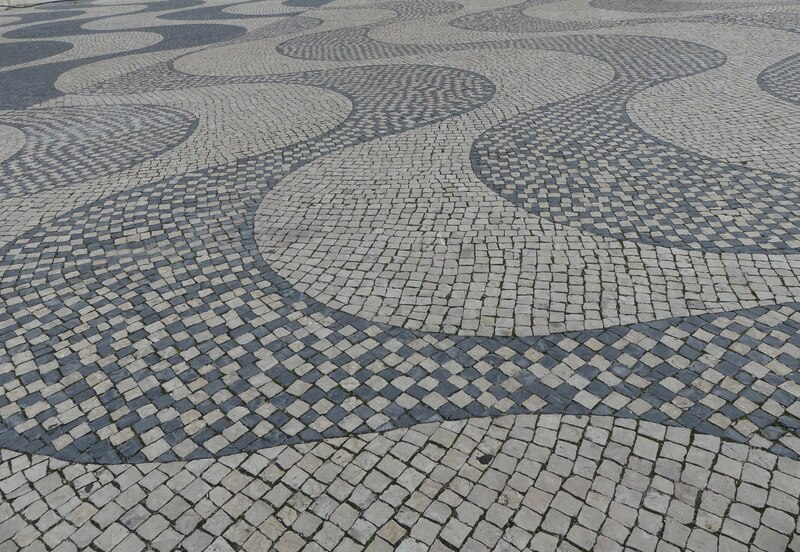 You’ve no doubt seen the incredible tile work that Portugal is famous for. When you are on the ground there, you can’t miss it - it’s everywhere! 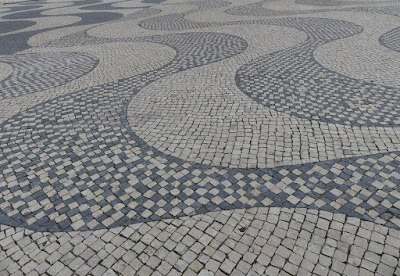 On sidewalks, on walls, at roadside shops (there’s even a tile museum in Lisbon). And the intricacy of some of this art is amazing. 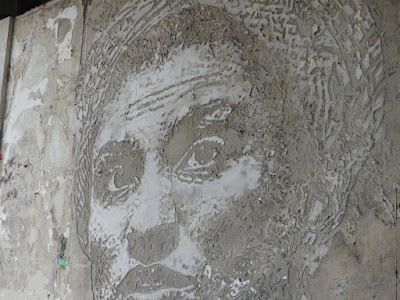 The photo below is of a different kind of art. The artist (who was profiled on 60 Minutes a few months ago) chisels his portraits out of concrete! The results were breathtaking. 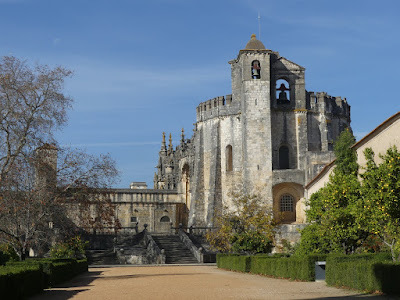 Portugal has a wealth of churches, castles, monasteries, forts, etc., and we saw many. One of the highlights was the Knights Templar Castle in Tomar. Built in 1160, it was the headquarters of the Knights Templar Order for 700 years. The history of the Knights Templar is fascinating (you can read about it here). Now, back to food. 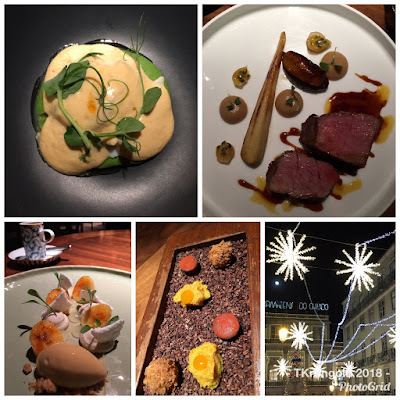 We celebrated our wedding anniversary while on this trip, so after much research, I made a reservation at Alma, the two Michelin starred restaurant in Lisbon. Run by chef-owner, Henrique Sa Pessoa, the fine dining venue is stark yet warm. The service is impeccable. The food is exquisite. From the bread service to the amuse bouche, to the highly creative entrees, and desserts, Alma is an oasis of tasteful cuisine. Lisbon is not short on Michelin starred restaurants. The other big name in town is Jose Avillez. Whereas Pessoa has one restaurant, Avillez has many. And they run the gamut from a high end temple to gastronomy (Belcanto), to the casual drop-in taberna (Bairro do Avillez). By a stroke of calendar and geographic luck, friends whom we had met on a trip to Alaska in 2016, who live in Idaho, were going to be in Lisbon at the same time (what are the odds of that?). We met them for dinner at another of the Avillez restaurant empire, Cantinho do Avillez, in the charming Chiado neighborhood. With a large and varied menu, there was plenty to choose from. Other than the fact that the restaurant is a bit dark and very loud, we enjoyed our dinner immensely. 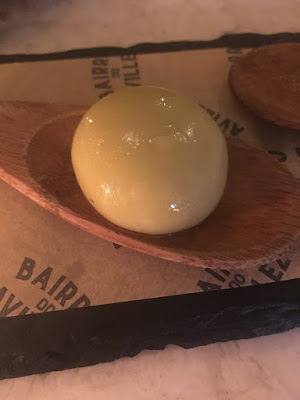 One night as Mr B and I were wandering the streets of Chiado, not quite sure what to do for dinner, we happened upon Bairro do Avillez, Chef Avillez’ casual market/taberna. Without a reservation, I wasn’t sure we’d get in, but without further ado, we were ushered right away to a table. Our meal started with one of Avillez’ signature items, “exploding olives.” I really don’t know how to explain exploding olives to you, except that through the magic of modern culinary arts, they take olive puree, alter its’ chemical structure, form it back into what looks like an olive, and when you put it in your mouth, it bursts. Fabulous! 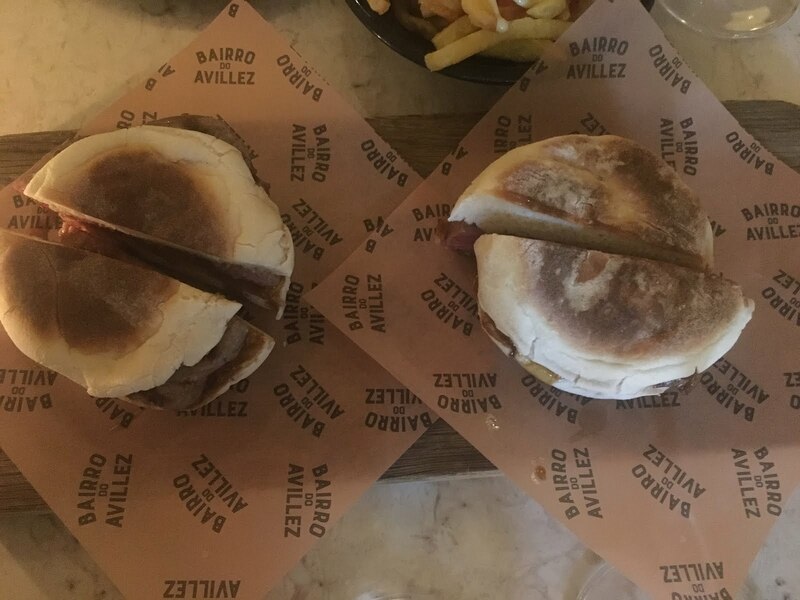 One of Portugal’s best known snacks is the “prego,” a steak sandwich. I had read about it in countless travel/food articles and was eager to try it. 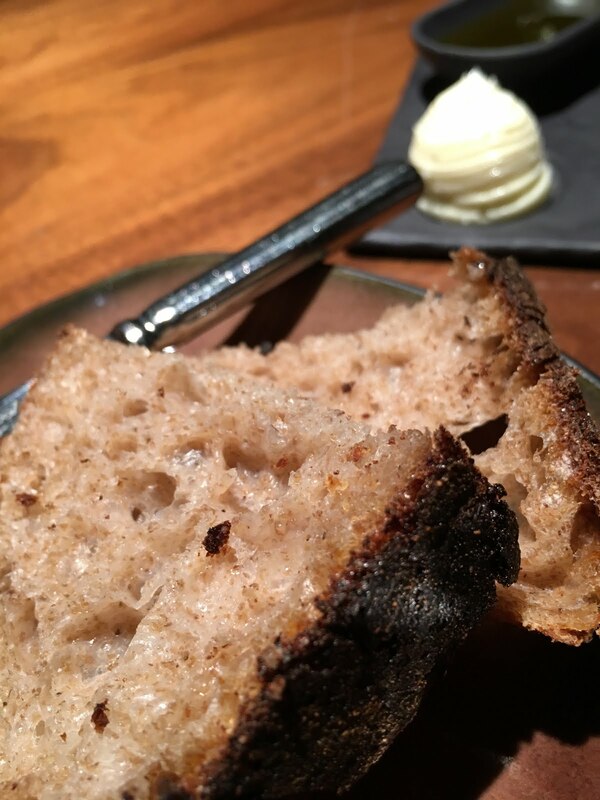 Served very rare on good Portuguese bread, the Taberna version is coated with mustard butter, and roasted garlic puree. Needless to say (but I will), it was excellent. Perfectly crisp and salted French fries accompanied it, along with a bottle of a wonderful Douro Valley red. It’s hard to cram 10 days worth of wonderful food and wine into one readable post so I’ll stop here for now. 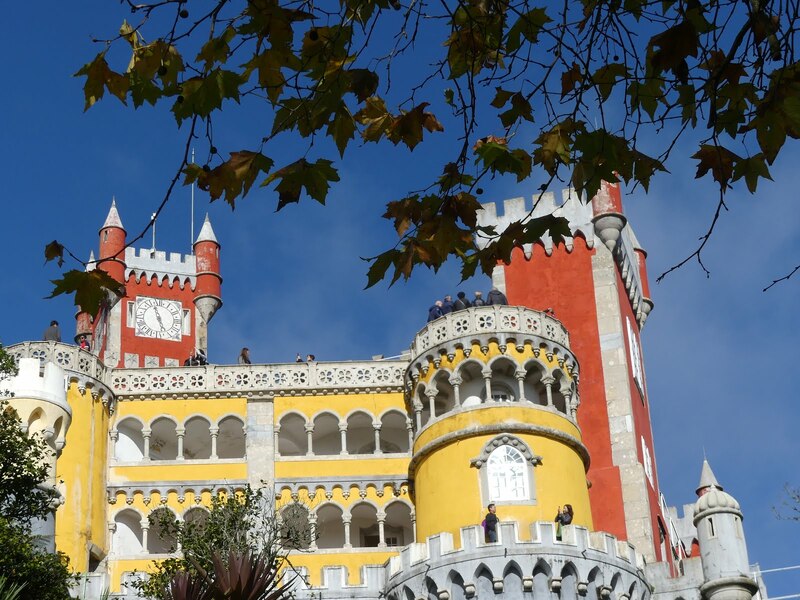 Next time, we venture to the lovely towns of Sintra, Obidos, Setubal, and Cascais.